In the latest edition of Behind the Scenes: Carnival Vista, Host Peter Gonzalez goes below deck to show viewers the many technical and operational innovations that are being incorporated into the massive “floating resort,” which is currently under construction at Italy’s Fincantieri shipyard and set to debut from Europe in May 2016. Gonzalez interviews Carnival Vista’s Captain Rocco Lubrano who discusses the ship’s groundbreaking “duck tail” stern design which optimizes the vessel’s hydrodynamics as well as stability. He also speaks to Chief Engineer Cesare Boldrini who talks about the ship’s massive power grid that is used to provide energy for the various guest, crew, engine and other operational areas within Carnival Vista’s 828,000 square feet of space. Boldrini also discusses the ship’s extensive on-board desalination plant that processes sea water used for everything from showers to the slides and other attractions within the sprawling WaterWorks aqua park. 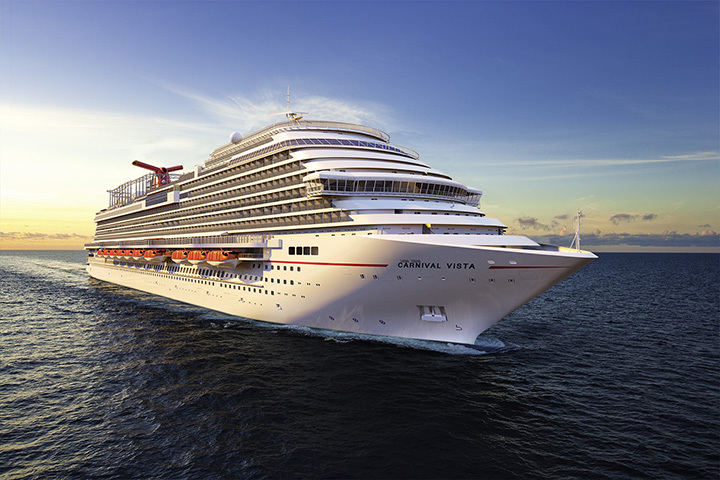 The newest, largest and most innovative ship in the Carnival fleet, Carnival Vista is scheduled to enter service from Trieste, Italy, on May 1, 2016, part of an inaugural European season that will run through October. The ship will then reposition to New York to operate a pair of voyages then shift to Miami for year-round Caribbean service beginning in November 2016.